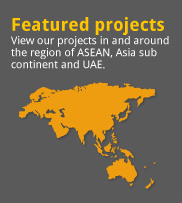 We are the first marine piling contractor in Asia to equip our piling barges with Real Time Kinematic Global Positioning System (RTK GPS) receivers for marine pile positioning in May 1997. We first used this system to position the mooring piles for Single Buoy Mooring System 8km offshore in Gujarat, India in September 1996. We have equipped our four piling barges with Trimble HYDROproTM software for marine piling in conjunction with RTK GPS receivers on piling barge and RTK base station. Equipped with this pile positioning system, we are able to eliminate the need to employ shore-based surveyors to position the marine piles. This system also allows piling to be conducted at night and in all weather conditions. Our productivity and accuracy have been significantly increased. We are able to drive piles up to 2.5m diameter and 50m long. 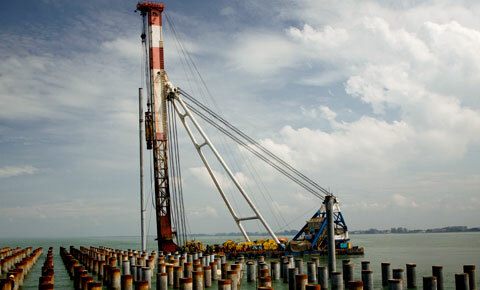 We are able to install deep and large diameter bored piles of 2.7m ~ 3.0m diameter and 50m ~ 100m depth. 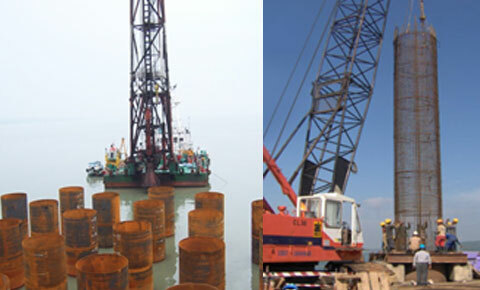 We specialized in installation of piles into rock especially in marine environment. We also designed and built some of our drilling equipment. We now own 10 units of Reverse Circulation Drill (RCD). We have also purchased the high power Down-The-Hole hammer drill (DTH). With this combination of the RCD machine and DTH Hammers drilling tool, we are able to achieve very high productivity when drilling in rock compared to the conventional drilling tool. High precision of the positioning and verticality alignment of the SPSP is required during the installation of each SPSP due to the high tolerance of the P-P type couplings. One of the technical challenges is to achieve complete closure of the cofferdam for the final external SPSP and also each individual group of Bulkhead SPSP. We install the piles with a combination of Hi-Pressure Water Jet system to penetrate through the dense sand and pebble layers and then driving with Hydraulic Vibro Hammer and Delmag D128 Diesel Hammer. 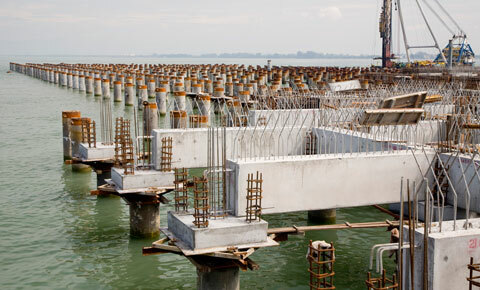 We installed 590 nos of 1,200mm dia interlocking SPSP and 42 nos of 1,200mm dia Steel Pipe Piles at Nhat Tan Bridge Project into dense sand and pebbles layers using Hi-Pressure Water Jet System. The piles form 5 cofferdams.